Raised in the backcountry, Kristy has spent a large amount of time hunting and trekking through the woods and jungles and appreciates serving as an ambassador for women hunters while experiencing the thrill of fair chase hunting. Titus has hunted throughout the world, including the African savannas. She is very passionate in areas that support wildlife and habitat conservation and outdoor recreation. 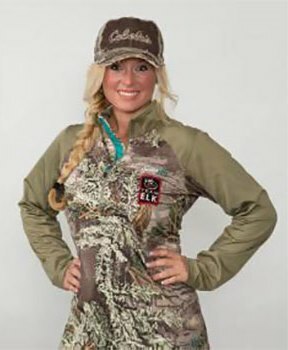 She is also a proud member of the Rocky Mountain Elk Foundation (RMEF), a featured member of RMEF Team Elk, part of the Pro Staff team for Swarovski Optik, and an ambassador for Cabelas. Kristy has received multiple awards, including taking 2nd and 3rd place in the Women's division in the 2012 and 2013 Rocky Mountain Elk Foundation World Elk Calling Championships. In addition to working with RMEF and Team Elk, Kristi's background includes Certified Clinical Sports Nutrition and Exercise representative and NPC figure competitor, instructor for NRA Basic Pistol and Refuse to be a Victim, and experience serving as Vice President and President of her local chapter of SCI for nearly 10 years. "We are excited to work with Kristy," said Bob George, Director of Sales and Marketing for Buck Knives. "Her experience in fair chase hunting and her passion for the outdoors are a great fit for our brand and our Buck Knives team." Kristy's mission is to inspire others, giving them the confidence to tackle the most demanding outdoor activities. For more information, visit www.Kristytitus.com.